For the Irish footballer, see Robbie Benson. Robin David Segal (born January 21, 1956), known by the stage name Robby Benson, is an American actor, singer, musician, director, producer, writer, composer and educator. He is known as the voice of Beast in the Disney animated film Beauty and the Beast and its numerous sequels and spin-offs, and directed several episodes of the sitcom Friends. Benson was born in Dallas, Texas, the son of Freda Ann (née Benson), a singer, actor, and business promotions manager, and Jerry Segal, a writer. His family is Jewish. Benson was raised in New York City and took his mother's maiden name as his stage name when he was 10. Benson made his film debut with an uncredited role in Wait Until Dark (1967) as the Boy Tossing Ball and his Broadway debut in The Rothschilds (1970). He had an appearance in a 1971 commercial for Reese's Peanut Butter Cups alongside Donny Most who would later co-star in Happy Days. Benson had an early role on the daytime soap Search for Tomorrow (1971–72). As a film actor, Benson was well known for teenage roles in coming-of-age films, such as 1972's Jory, 1973's Jeremy, and as Billy Joe McAllister in 1976's Ode to Billy Joe. In 1975, Benson appeared in Death Be Not Proud and Lucky Lady. That year, he also screen tested for the role of Luke Skywalker in "Star Wars", a role which eventually went to Mark Hamill. In 1977, Benson starred in One on One (which he co-wrote with his father) and the TV movie The Death of Richie. In 1978, he co-starred in The End and also Ice Castles, co-starring Lynn Holly Johnson, who was a U.S. national figure skating medalist. Benson, who had never ice skated before, learned to skate in order to film the movie, which had numerous skating scenes, including ice hockey. In 1980, Benson starred opposite Linda Grovenor in the Orion film, Die Laughing. The same year, Benson also starred in the movie Tribute opposite Jack Lemmon. In 1981, he costarred in the film The Chosen, based on the book of the same name by Chaim Potok. The New York Times gave the film a mixed review, but noted that Benson's character was "full of a gentle inquisitiveness that cannot help but win the audience's sympathy." Benson played Olympic 10,000-meter gold medalist Billy Mills in the 1983 film Running Brave. In 1991, he starred as the voice of Beast in the acclaimed animated Disney film Beauty and the Beast. Later in the 1990s he voiced lead character J.T. Marsh on the acclaimed sci-fi cartoon series Exosquad. His 2007 novel Who Stole the Funny? : A Novel of Hollywood landed Benson on the LA Times Bestseller list. Benson's medical memoir I'm Not Dead ... Yet! was released in June 2012. Benson has been a professor at New York University's Tisch School of the Arts, the University of Utah and the University of South Carolina. It was announced he would serve as a professor of Practice in the fall of 2013 at Indiana University. Benson left the university after the Spring 2016 semester when his three-year contract expired. Benson married singer and actress Karla DeVito on July 11, 1982. The pair met while both starred in The Pirates of Penzance. Together they have two children, daughter Lyric (b. 1983) and son Zephyr (b. 1992). Doctors diagnosed Benson with a heart murmur when he was a teenager, and underwent the first of four open heart surgeries in 1984 to fix a previously diagnosed heart valve defect. He is an activist and fundraiser for heart research, which, in 2004, led him to write the book, lyrics and music for an original Off-Broadway play called Open Heart, in which he also starred. He practices Transcendental Meditation. 1976 One Day at a Time Ken Episode: "The College Man"
1985 Alfred Hitchcock Presents Ed Episode: "Method Actor"
1990 Deadly Nightmares Bart Episode: "Tourist Trap"
1992 Batman: The Animated Series Wilkes (voice) Episode: "P.O.V." 1993 Avonlea Jonathan Ravenhurst Blackwell Episode: "The Disappearance"
1994 The Magic School Bus Archibald Seedplot (voice) Episode: "Goes to Seed"
2001 The Huntress Dana Weatherly Episode: "Who Are You?" ^ "Robby Benson Biography (1956-)". filmreference.com. ^ Gordon, Buzz (July 4, 2003). "Pulling Up Stakes". The Jewish Journal of Greater Los Angeles. Retrieved December 13, 2006. ^ a b Roston, Tom (October 12, 2008). "Robby Benson directs 'Billy: The Early Years'". Los Angeles Times. Retrieved June 17, 2009. ^ Maslin, Janet (August 19, 1977). "One-on-one Star And Writer Robby Benson Elated By Role..." St. Petersburg Times. pp. 14D. Retrieved June 17, 2009. ^ "Wait Until Dark". RareFilmFinder. Retrieved May 30, 2011. ^ Maslin, Janet (April 30, 1982). "Movie review: 'The Chosen'". The New York Times. Retrieved October 18, 2011. ^ Who Stole the Funny? : A Novel of Hollywood, HarperCollins Publishers, 2007. ISBN 0-06-124500-3. ^ "Actor Robby Benson Is 'Not Dead ... Yet!'". NPR.org. Retrieved September 30, 2018. ^ "Teaching credits". Robby Benson's official website. Bengal Productions, Inc. Archived from the original on April 29, 2009. Retrieved March 25, 2013. 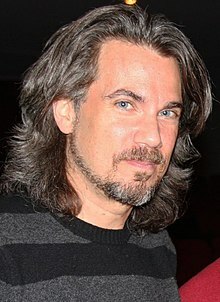 ^ "Actor and director Robby Benson to join Indiana University's telecommunications faculty". Indiana University. Retrieved March 25, 2013. ^ Creps, Marcela (April 25, 2016) "Robbie Benson leaving UI, having made a lasting impact". Indiana University. Retrieved April 26, 2018. ^ Mackay, Kathy (October 11, 1982). "Gilbert and Sullivan's Most Improbable Pair? Robby Benson and Rocker Karla DeVito". People. ^ Roston, Tom (October 12, 2008). "The odd career twist of a former screen heartthrob". The Los Angeles Times. ^ "Robby Benson: Inside His 'Brutal Experience' of Four Heart Surgeries". PEOPLE.com. Retrieved September 30, 2018. ^ Genzlinger, Neil (March 23, 2004). "Theater in Review: Words Can Never Harm Him, But Cardiac Arrest Can". The New York Times. Retrieved October 18, 2011. This page was last edited on 16 April 2019, at 11:38 (UTC).